Although Syk has been reported to be associated with IL-2Rα and IL-15Rα in some hematopoietic cells, its association has never been investigated in the IL-4/IL-4R system. In this study, we demonstrate for the first time that Syk is constitutively associated with IL-4Rα in human polymorphonuclear neutrophils (PMNs) and that IL-4 stimulation increases the amount of Syk associated with IL-4Rα. Moreover, upon IL-4 treatment, a pool of Syk associated with IL-4Rα is phosphorylated. We also report that such association is not unique to PMNs because Syk associates with IL-4Rα in Raji and in PBMC cells. Stimulation of PMNs by IL-4 increased the amount of Syk associated with PLC-γ2, pAkt, and α-tubulin. Pretreatment of cells with the Syk-selective inhibitor piceatannol or Syk inhibitor II, significantly inhibited the ability of IL-4 to enhance phagocytosis and cell adhesion and to delay apoptosis, and these results correlate with the ability of piceatannol to reduce Syk activation and its association with IL-4Rα. Down-regulation of Syk by antisense techniques demonstrates the importance of Syk in the antiapoptotic effect of IL-4. We conclude that association of Syk to IL-4Rα is of biological significance and that IL-4Rα is a new candidate to be added to the few cytokine receptor components which associate with Syk. Interleukin 4 is a member of the CD132 (γc)-dependent cytokine family, which also includes IL-2, IL-7, IL-9, IL-15, and IL-21 (1). We have demonstrated previously that human polymorphonuclear neutrophils (PMNs)3 are targets of IL-4 (2) and that these cells express only the type I IL-4R composed of (IL-4Rα and CD132) (3). In contrast to IL-4Rα and IL-15Rα, human PMNs do not express IL-2Rα, IL-7Rα, IL-9Rα, and IL-21Rα components, indicating why only IL-4 and IL-15 are potent neutrophil agonists (2, 3, 4, 5, 6, 7). 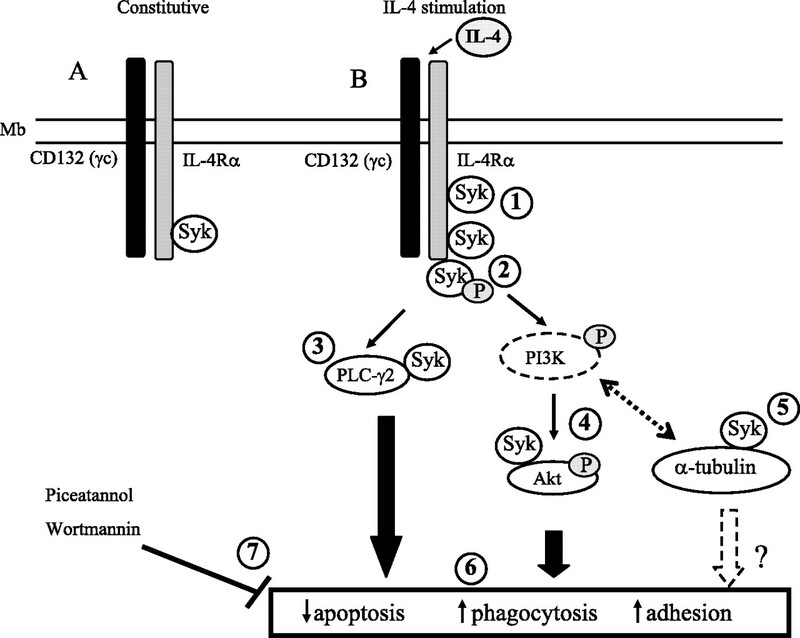 IL-4 exerts several effects on neutrophil cell physiology. It enhances PMN-mediated killing of opsonized bacteria and increases the respiratory burst mediated by the peptide fMLP (7). IL-4 is also known to delay PMN apoptosis, enhance phagocytosis of opsonized SRBCs, and to induce RNA and de novo protein synthesis in these cells (2). Although the cell signaling events involved in IL-4-induced PMNs are not fully understood, we have recently documented that IL-4 recruits the Jak-STAT-SOCS and MAPK pathways and that it activates Syk in these cells (2) as well as in promyelocytic leukemia PLB-985 cells (8). Recently, IL-15 was found to enhance human PMN phagocytosis by a Syk-dependent mechanism and the importance of the IL-15Rα-chain in IL-15-induced PMNs has been demonstrated (9). Syk is a 72-kDa protein tyrosine kinase that plays a central role in coupling immune recognition receptors to multiple downstream signaling pathways in different hematopoietic cells such as B cells, mast cells, platelets, and macrophages (10, 11, 12). Once activated, Syk phosphorylates its specific substrates including PLCγ isoforms, Akt, and tubulins, orchestrating a series of cellular responses such as proliferation, survival, migration, and phagocytosis (11, 13, 14, 15, 16, 17, 18). In PMNs, Syk has been described to be essential for adhesion mediated by integrin, phagocytosis, chemotaxis, and transmigration (16, 17, 18). Genetic analysis of Syk-deficient murine PMNs revealed that this protein plays an indispensable role in B2 integrin-mediated PMN functions, such as respiratory burst and degranulation (16). Syk also plays a key role in the tyrosine phosphorylation of tubulin (18). A Syk selective inhibitor was found to block receptor-stimulated tubulin phosphorylation and tubulin was not phosphorylated in B cell lines lacking endogenous Syk kinase. Law et al. (19) demonstrated that Syk isolated from BCR-activated B cells can phosphorylate PLCγ1 in vitro on a key regulatory tyrosine residue involving in vivo activation of PLCγ1. Also, Bulanova and colleagues (20) demonstrated that treatment of human Raji B cells and primary B cells activated by IL-15 induced phosphorylation of Syk leading to PLCγ1 phosphorylation. In another study, a direct interaction between Syk and PI3K has been demonstrated (21). These data indicate that Syk has the ability to interact with several proteins. Because of the above observations, we hypothesized that the IL-4-induced Syk activation we have reported (3, 8) involves interaction of IL-4Rα with Syk and that this leads to phosphorylation of several Syk substrates. Although Syk is known to associate with IL-2R components in lymphocytic cells and with the βc chain of the IL-3R, IL-5R, and GM-CSFR in human eosinophils (22), its association has never been investigated in the IL-4/IL-4R system. In this study, we demonstrate for the first time that Syk associates with IL-4Rα in human PMNs and also in human B cells as well as in PBMCs. We also evaluate the role of Syk/IL-4Rα association in IL-4-mediated signaling events in PMNs as well as its role in different IL-4-induced human neutrophil functions. IL-4 was obtained from PeproTech. The Syk inhibitor piceatannol was purchased from Sigma-Aldrich and the Syk II inhibitor (catalog no. 57471) was purchased from EMD Biosciences. Specific mouse Ab anti-human IL-4Rα was purchased form R&D Systems. Specific mouse Ab anti-human Syk, rabbit anti-phosphorylated PI3K, and rabbit anti-human PLCγ2 were purchased from Santa Cruz Biotechnology. Specific rabbit-anti-human phosphorylated Syk and rabbit-anti-human phosphorylated Akt were purchased form Cell Signaling Technology. The mouse monoclonal anti-human α-tubulin was purchased from Sigma-Aldrich and the mouse anti-human anti-IL-2Rβ was purchased from BD Pharmingen. The mouse anti-phosphotyrosine (anti-p-tyr) was purchased from Upstate Biotechnology. HRP-goat-anti-rabbit IgG and HRP-goat-anti-mouse IgG were purchased form Jackson ImmunoResearch Laboratories. Tris-HCl, NaCl, Triton X-100, and SDS were purchased from Fisher Scientific. Orthovanadate, PMSF, aprotinin, leupeptin, and pepstatin were purchased from Sigma-Aldrich. The ECL kit was purchased from Amersham Biosciences. FBS and OPTI-MEM medium were from Invitrogen Life Technologies. PMNs were isolated from the venous blood of healthy volunteers by dextran sedimentation followed by centrifugation over Ficoll-Hypaque (Pharmacia Biotech) as described previously (2, 3, 5, 6). Human PBMCs were harvested during neutrophil isolation (5). Blood donations were obtained from informed and consenting individuals according to institutionally approved procedures. Cell viability (>98%) was monitored by Trypan blue exclusion, and the purity (>98%) was verified by cytology from cytocentrifuged preparations colored by the Hema 3 stain set (Biochemical Sciences). Human Raji B lymphocytes were purchased from American Type Culture Collection (ATCC) and were maintained in RPMI 1640 5% FCS and antibiotics. PMNs (7 × 106 cells/condition) were pretreated or not with piceatannol (30 μM) for 30 min and then treated with control PBS or with IL-4 (100 ng/ml) for the indicated periods of time, centrifuged, and lysed in nondenaturing cold lysis buffer (50 mM Tris-HCl (pH 7.4), 100 mM NaCl, 1% Triton X-100, 0.01% SDS, 1 mM orthovanadate, 1 mM PMSF, 10 μg/ml trypsin inhibitor, and 10 μg/ml aprotinin, leupeptin, and pepstatin) for 1 h on ice and sonicated three times. The lysates were precleared using 30 μl proteins G-Sepharose (Amersham Biosciences). After 1 h, brief centrifugation was performed to remove the Sepharose beads, and the samples were incubated with 2 μg/ml mouse anti-human IL-4Rα or anti-human PLC-γ2; anti-pAkt; or anti-α-tubulin at 4°C with gentle agitation overnight at 4°C. Protein G-Sepharose (30 μl) was then added for a further 3-h incubation. The solid matrix was collected and washed three times with cold lysis buffer before suspending it in 35 μl sample buffer and boiling to 100°C for 5 min. Immunoprecipitates were electrophoresed on a SDS-polyacrylamide gel, followed by Western blot analysis with the indicated Abs according to protocols described below. After cell treatment under different conditions, whole cell lysates were prepared as described previously (3). The proteins were denatured and reduced by boiling the samples at 100°C for 5 min. Equivalent amounts of protein were resolved on polyacrylamide gels and transferred onto polyvinylidene difluoride or nitrocellulose membranes (Millipore) by electroblotting. After the transfer, membranes were blocked for 1 h in TBS-Tween plus 5% nonfat dry milk (Carnation) or in TBS-Tween plus 5% BSA. Membranes were then incubated overnight at 4°C with primary IL-4Rα (MAB230, clone 25463) or with antiphosphospecific Syk Ab (Tyr525/526, 2711); Ab directed against the nonphosphorylated form of Syk (SC-1240, clone 4D10); anti-p-AKT (Ser473, D9E); anti-PLCγ2 (H-160, sc-9015); anti-p-PI3K (Tyr508, sc-12929R); or anti-α-tubulin in TBS-Tween plus 5% BSA or in TBS-Tween plus 5% nonfat dry milk. Membranes were then washed three times with TBS-Tween and incubated for 1 h at room temperature with a goat anti-rabbit HRP secondary Ab (Jackson ImmunoResearch Laboratories) at 1/20,000 in TBS-Tween plus 5% nonfat dry milk or a goat anti-mouse HRP secondary Ab (Jackson ImmunoResearch Laboratories) at 1/20,000 in TBS-Tween plus 5% nonfat dry milk followed by washes. The different protein expression was revealed with an ECL Western blotting detection system as previously published and quantified using a Fluor-S multi-imager (Bio-Rad) and the MultiAnalyst version 1.1 program (Bio-Rad). Freshly isolated human PMNs (2 × 106 cells/ml in RPMI 1640-HEPES-P/S, supplemented with 10% heat-inactivated autologous serum) were pretreated or not with pharmacological inhibitors and then incubated for 24 h in the presence or absence of IL-4 (100 ng/ml). Cytocentrifuged samples of PMNs were prepared using a Cyto-tek centrifuge (Miles Scientific), stained with the Hema 3 Stain staining kit according to the manufacturer’s instructions and processed as documented previously (5, 6). Cells were examined by light microscopy at ×400 final magnification, and apoptotic neutrophils were defined as cells containing one or more characteristic, darkly stained pyknotic nuclei. Apoptosis was also assessed by flow cytometry following staining with FITC-annexin-V, as described previously (5). In brief, cells were washed in PBS and resuspended in 100 μl 1× annexin-V binding buffer, mixed with 3 μl FITC-conjugated annexin-V (Biosource). Cells were gently vortexed and incubated for 15 min at 4°C in the dark. A volume of 400 μl 1× annexin-V binding buffer was added, and incubation was continued for an additional 15 min in the dark before fluorescein-activated cell sorter analysis (10,000 events) using a FACScan (BD Biosciences). PMNs (2 × 106/ml) were incubated with a mixture of two Syk antisense oligonucleotides (ASO) previously used by others (17) (5′-CTCGGATCAGGAACTTTCCAT and 5′-CATGGAAACCTGATGAACCAG) or scrambled oligonucleotides (scr-ODN) (5′-TCGACA-AGTCGACTTTCATCG and 5′-GATGGAAACCTGCAGATACCA) with a phosphorothioate backbone (Operon Biotechnologies) at a final concentration of 5 μM each at 37°C in Opti-MEMI medium alone without addition of serum for 6 h to increase uptake of the oligonucleotides. Subsequently, cells were cultured for 22 h in Opti-MEMI medium supplemented with 5% heat-inactivated autologous serum in the presence or absence of IL-4. Apoptosis was assessed as above and the level of Syk protein expression was verified by immunoprecipitation and immunoblotting. SRBCs were opsonized with a final 1/200 dilution of rabbit IgG anti-SRBC Ab (Sigma-Aldrich) followed by incubation for 45 min at 37°C as described previously (3). PMNs (4 × 106 cells/ml in RPMI 1640) per condition were pretreated 30 min with buffer or IL-4 (100 ng/ml) and then incubated with 20 × 106 opsonized SRBCs for 45 min as above. The samples were centrifuged at 200 × g at 4°C for 10 min. Supernatants were discarded, and noningested SRBCs were eliminated by performing osmotic shock on the pellets by treating them with 300 μl H2O for 15 s followed immediately by the addition of 4.5 ml ice-cold PBS (PBS; 1×). The samples were washed twice with ice-cold PBS, and the final pellets were suspended to a final concentration of 4 × 106 cells/ml. Duplicate cytocentrifuged preparations were prepared with aliquots of ∼200 μl, stained with the Hema 3 Stain staining kit and observed by cytology essentially as previously documented (3). Phagocytosis was measured as percentage of neutrophils ingesting at least one opsonized SRBC. This was performed essentially as previously documented (23). The human epithelial lung cell line A549 (ATCC) was grown in RPMI 1640 supplemented with 10% FCS and antibiotics. Cell viability was systematically evaluated before and after each treatment, and mortality never exceeded 5%. A549 cells were grown on glass coverslips and, at confluence, they were washed twice with PBS. PMNs were pretreated or not with pharmacological inhibitors, then stimulated by IL-4 (100 ng/ml) for 2 h (previously found to be an optimal time course), and were labeled for 30 min with 5 μM calcein-AM (Molecular Probes) according to the manufacturer’s recommendation. After the incubation, 1 ml of neutrophil suspension (5 × 106 cells/ml) was added to each well of a 12-well plate containing confluent A549 cells on a coverslip for 30 min. After the incubation, coverslips were extensively washed and mounted on a glass slide. The number of adherent PMNs was calculated by counting the number of fluorescent cells from five randomly selected high-power fields (×400) observed with a photomicroscope Leica equipped with an ebq 100 dc epifluorescent condenser. Images were taken with a Cooke Sensicam high-performance camera (Applied Scientific Instrumentation) coupled to the Image Pro-plus (version 4.0; Media Cybernetics) program. Statistical analysis was performed with SigmaStat for Windows version 3.0 (SPSS) using Student’s t test. Statistical significance was established at p < 0.05. Knowing that IL-4 is a human neutrophil agonist leading to Syk activation (3, 8) and that Syk was previously found to be associated with the IL-15Rα subunit in human B cells (20) and more recently in human PMNs (3, 9), we hypothesized that Syk could also associate with IL-4Rα in human PMNs. As illustrated in Fig. 1⇓A (upper panel), Syk was detected by immunoblotting following immunoprecipitation with an anti-IL-4Rα Ab in cells pretreated with buffer or piceatannol, a specific Syk inhibitor. Furthermore, the amount of Syk associated with IL-4Rα was increased following activation of cells by IL-4. Interestingly, pretreatment of cells with piceatannol at a concentration known to be suitable in human PMNs without interfering with cell viability and functions (3) was found to decrease the association of Syk with IL-4Rα (Fig. 1⇓A), suggesting that a pool of Syk associated with IL-4Rα is activated/phosphorylated. To demonstrate that a pool of activated Syk is associated with IL-4Rα, PMNs were treated with buffer or IL-4 in the presence or absence of piceatannol and IL-4Rα was immunoprecipitated followed by immunoblotting with an Ab recognizing the phosphorylated form of Syk. As illustrated in Fig. 1⇓B, a pool of phosphorylated Syk was associated with IL-4Rα only when cells were activated by IL-4. 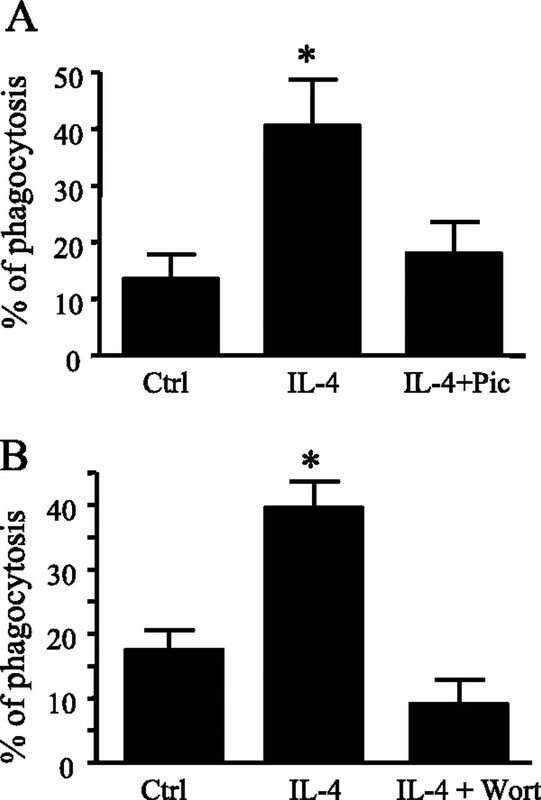 Pretreatment of cells with piceatannol completely reversed the ability of IL-4 to induce association of phosphorylated Syk with IL-4Rα. In all conditions, the level of IL-4Rα was relatively constant (Fig. 1⇓, A and B, lower panels). To answer whether or not the association of Syk with IL-4Rα is unique to PMNs, we verified whether such an association was observed in whole human PBMCs harvested during the preparation of PMNs and in Raji B cells, because Syk is known to be associated with two other receptor components, IL-15Rα and IL-2Rβ in these latter cells (20). As illustrated in Fig. 1⇓, C and D, Syk is also associated with IL-4Rα in PBMCs and in Raji B cells, respectively. However, in contrast to PMNs, IL-4 did not increase the amount of Syk associated with IL-4Rα in human PBMCs and in Raji B lymphocytes. Association between Syk and IL-4Rα. Freshly isolated human PMNs (A and B), PBMCs (C), or Raji B cells (D) (7 × 106 cells/ml) were pretreated or not with 30 μM piceatannol (Pic) for 30 min and then incubated with buffer (Ctrl) or with 100 ng/ml rhIL-4 (IL-4) for 1 min. A and B, Immunoprecipitation (IP) with an anti-IL-4Rα Ab and immunoblotting (IB) with an anti-Syk (A) or anti-phosphorylated Syk (P-Syk) (B) Abs were performed. Loading control was verified by IP and IB with the anti-IL-4Rα Ab (lower panels, A and B). Inset in A, lane 1, no IP, followed by WB anti-Syk; lane 2, IP: anti-IL-4Rα plus WB: anti Syk in control cells; lane 3, IP: anti-IL-4Rα plus WB: anti-Syk in cells treated with IL-4. Inset in B, lane 1, IP with an isotype-matched irrelevant Ig followed by WB anti-P-Syk; lane 2, IP: anti-IL-4Rα plus WB: anti P-Syk in control cells, and lane 3, IP: anti-IL-4Rα plus WB: anti-P-Syk in cells treated with IL-4. Corresponding densitometry analysis is illustrated as bar graph. The results are expressed as ratios obtained by dividing the data from the tested group/corresponding control (tested/Ctrl). 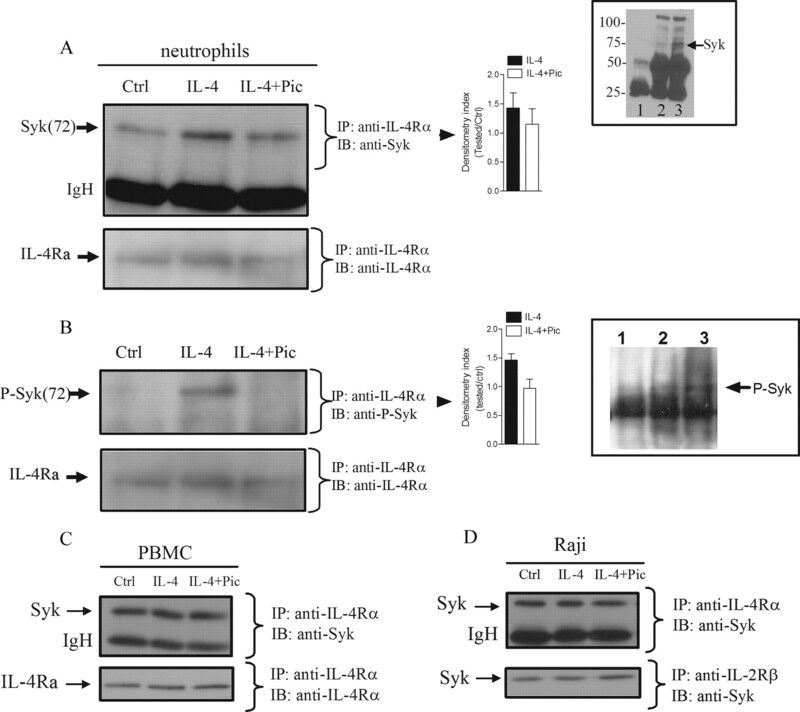 C and D, Association between IL-4Rα and Syk in IL-4-stimulated human PBMCs and Raji cells was performed as in A. Loading control was verified by IP and IB with the anti-IL-4Rα (C) or by IP and IB with an anti-IL-2Rβ (D). Results are from one representative experiment of at least three. Although it was previously reported that PLCγ isoforms, PI3K, and α- and β-tubulins are Syk substrates (18, 19, 20, 24, 25), this has never been demonstrated in PMNs. Knowing that Syk is activated by IL-4 in human PMNs (3), and that this kinase is associated with the IL-4Rα-chain (this report), we were interested in determining whether Syk binds to other Syk substrates and whether such association could be altered by inhibiting Syk. To do so, PMNs were pretreated with buffer or piceatannol and then stimulated with IL-4. Each substrate was immunoprecipitated with a specific Ab and then immunoblotted with anti-Syk Ab. As illustrated in Fig. 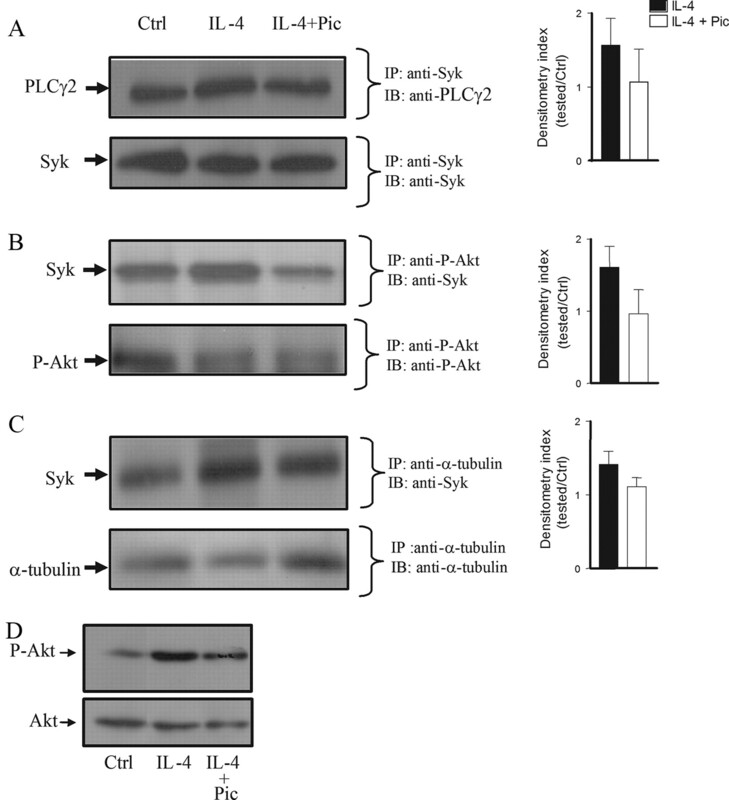 2⇓A (upper panel), Syk is constitutively associated with PLCγ2, and the amount of Syk associated with PLCγ2 was increased by IL-4 stimulation. Interestingly, this association was decreased by piceatannol. In addition to PLCγ2, both pAkt and α-tubulin were found to be associated with Syk in control cells and these associations were slightly increased following IL-4 stimulation and attenuated by piceatannol treatment (Fig. 2⇓, B and C, respectively). Thus, these results indicate that Syk interacts with the two known substrates PLCγ2 and α-tubulin previously reported in B cells (20, 24, 25) and that these substrates are probably involved in IL-4-induced signaling in human PMNs. In addition, we found that Syk also interacts with pAkt. We have previously documented that IL-4 activates several cell signaling pathways in human PMNs (3) and that, using a panel of pharmacological inhibitors including piceatannol and the PI3K inhibitor wortmannin, we found that the ability of IL-4 to delay PMN apoptosis was attenuated, at least partially, via Syk and PI3K. Although we have previously reported that IL-4 increased phosphorylation of Syk in human PMNs (3), the ability of this cytokine to activate Akt has never been investigated in these cells. Therefore, we investigated whether or not Akt was activated in IL-4-induced PMNs. As illustrated in Fig. 2⇓D, IL-4 markedly increased phosphorylation of Akt and this was reversed by piceatannol. Thus, IL-4 can activate not only Syk, but also the downstream kinase Akt, indicating that the Syk/PI3K/Akt pathway is activated by IL-4 in human PMNs. Association of Syk with PLCγ2, pAkt, and α-tubulin in IL-4 stimulated PMNs. Freshly isolated human PMNs (7 × 106 cells/ml) were pretreated or not with 30 μM piceatannol (Pic) for 30 min. Then, cells were stimulated or not with 100 ng/ml IL-4 for 5 min, followed by immunoprecipitation (IP) with an anti-Syk Ab and by immunoblotting with an anti-PLCγ2 Ab (A); or IP with an anti-phosphorylated Akt (pAkT) and IB with the anti-Syk (B); or IP with an anti-α-tubulin and IB with the anti-Syk (C). Control of loading was verified by IP anti-Syk and IB anti-Syk (A, lower panel); IP anti-p-Akt and IB anti-pAkt (B, lower panel) or IP anti-α-tubulin and IB anti-α-tubulin (C, lower panel). Corresponding densitometry analysis is illustrated as bar graph. The results are expressed as ratios obtained by dividing the data from the tested group/corresponding control (tested/Ctrl). D, PMNs (2 × 106 cells/ml) were pretreated or not with 30 μM piceatannol for 30 min and then stimulated with or without 100 ng/ml IL-4 for 5 min. Phosphorylation of Akt was assessed by IB with the anti-p-Akt. The membrane was stripped and probed with an anti-Akt to verify equivalent loading. Results are from one representative experiment of at least three. Because we have previously documented indirectly that IL-4 delays human PMN apoptosis by a Syk-dependent mechanism as suggested by inhibition experiments with piceatannol (3), we decided to further elucidate the role of Syk in response to IL-4, knowing that this kinase associates with IL-4Rα. To do so, we used an antisense strategy. As illustrated in Fig. 3⇓A, the apoptotic rate of cells incubated with scr-ODN in the absence of IL-4 was significantly decreased from 82.6% ± 4.9 (mean ± SEM, n = 8) to 50.9% ± 5.4 (n = 8) in the presence of IL-4, indicating that oligonucleotides do not interfere with the efficiency of the cytokine to delay PMN apoptosis (2). The antiapoptotic effect of IL-4 was markedly reversed by addition of Syk-ASO (74.3% ± 5.9) whereas the scr-ODN had no such effect (53.8% ± 6.6). As a control, we confirmed in parallel the antiapoptotic effect of IL-4 in human neutrophils as well as the ability of piceatannol to reverse this biological response, as previously documented (3). As illustrated in the inset of Fig. 3⇓A, we confirmed the antiapoptotic effect of IL-4 as the apoptotic rate decreased from 62.1% ± 7.2 (n = 4) in control cells to 31.0% ± 4.9 (n = 4) in IL-4-activated cells and that piceatannol reversed the antiapoptotic effect of IL-4, because the percentage of apoptosis was comparable to the basal level (59.3% ± 7.5, n = 4). In another cohort of experiments, the Syk inhibitor II (1 μM) reversed the antiapoptotic effect of IL-4 from 18.1% ± 2.7 (n = 4) to 35.7% ± 7.4, a value close to the basal level (35.7% ± 7.4) and to cells treated with the inhibitor alone (36.2% ± 6.4). For simplicity, these data are not present in a bar graph. In addition to these experiments, we demonstrated, at the protein level, that the expression of Syk was markedly decreased when cells were treated with Syk-ASO and not with scr-ODN (Fig. 3⇓B). Collectively, these results demonstrate the importance of Syk in the antiapoptotic effect of IL-4. Importance of Syk in the antiapoptotic effect of IL-4 in human neutrophils. A, Cells (2 × 106/ml) were treated with or without 5 μM Syk-ASO or scr-ODN for 6 h in Opti-MEMI as described in Materials and Methods. Cells were then stimulated with or without 100 ng/ml IL-4 for 20 h in the presence of 5% heat-inactivated autologous serum. After this incubation, apoptosis was evaluated by cytology. Results are expressed as means ± SEM (n = 8). The role of Syk for inhibiting the antiapoptotic effect of IL-4 was confirmed in parallel (inset, n = 4). ∗, p ≤ 0.05 vs Ctrl. B, The efficiency of Syk-ASO was verified by IP followed by IB with the anti-Syk Ab. Note the decrease of Syk protein expression when cells were incubated in the presence of Syk-ASO as compared with cells incubated with scr-ODN or without oligonucleotides (ODN). IgG heavy chains (IgH) demonstrated equivalent loading. Results are from one representative experiment of three. In a previous study, we demonstrated that, like IL-15 (6), IL-4 was able to increase the ability of PMNs to ingest opsonized SRBCs (26). However, the role of Syk during this biological process, although highly predictable, has never been investigated. Because we found that IL-4 also activates Akt (this report) we investigated the potential involvement of both Syk and its downstream targets PI3K/Akt in parallel using pharmacological inhibitors. As illustrated in Fig. 4⇓A, pretreatment of PMNs with piceatannol significantly reduced the ability of IL-4 to exert phagocytosis from 40.5% ± 8.2 (mean ± SEM, n = 4) to 18.0% ± 5.6, which is similar to the basal level of 13.5% ± 4.3. Using wortmannin, the ability of IL-4 to enhance phagocytosis of SRBCs decreased from 39.5% ± 4.1 (mean ± SEM, n = 4) to 9.1% ± 3.7 (n = 4), which is lower than the basal level of 17.5 ± 3.1 (n = 4) (Fig. 4⇓B). As expected, each of the inhibitors did not alter the basal level of phagocytosis when tested alone (9, 27). To further support a role of Syk, the other inhibitor (Syk inhibitor II) has been tested and the results are (n = 4): 22.5% ± 1.2 (Ctrl), 37.7% ± 4.4 (IL-4), 17.7% ± 3.8 (IL-4 plus inhibitor), and 16.2% ± 6.7 (inhibitor alone). Involvement of Syk and PI3K in IL-4-enhanced phagocytosis of PMNs. Freshly isolated human PMNs (4 × 106) were pretreated or not with 30 μM piceatannol (Pic; A) or 1 μM wortmannin (Wort; B) for 30 min. Then, cells were incubated in the presence of buffer (Ctrl) or 100 ng/ml IL-4 for 30 min before incubation with 20 × 106 opsonized SRBCs for 45 min. Phagocytosis was measured as percentage of neutrophils ingesting at least one opsonized SRBC. Results are means ± SEM (n = 4). ∗, p ≤ 0.05 vs Ctrl. Because Syk is known to be involved in PMN cell adhesion (16), we next investigated whether or not IL-4 could modulate the ability of neutrophils to adhere onto a cell substrate. Using human epithelial lung A549 cells as substrates, as we previously performed with IL-15 (23), we found that the adhesion of IL-4-induced PMNs onto these cells significantly increased when compared with untreated PMNs, reaching an increased factor of ∼3.5 (n = 11) (Fig. 5⇓A). Interestingly, the ability of IL-4 to induce PMN cell adhesion was similar to that observed in response to the potent neutrophil agonist, LPS. Knowing that IL-4 enhances adhesion of PMNs onto the cell substrate, we next investigated the role of Syk and PI3K/Akt in this biological response. As illustrated in Fig. 5⇓, B and C, IL-4 enhanced neutrophil adhesion by a Syk- and PI3K/Akt-dependent mechanism, respectively. To further support a role of Syk, the Syk inhibitor II has also been tested alone or in combination with IL-4 or buffer, and the results were similar (data not shown). IL-4 increases neutrophils adhesion by a Syk- and PI3K-dependent mechanism. A, PMNs were incubated with buffer (Ctrl), 1 μg/ml LPS, 100 or 250 ng/ml IL-4 for 2 h, labeled with calcein AM, incubated on confluent A549 cells for 30 min and adhesion was measured as described in Materials and Methods. Results are expressed as adhesion index (tested/Control) and means ± SEM (n = 11). Inset, Typical data plotted in the bar graph. ∗, p ≤ 0.05 vs Ctrl. B and C, PMNs were pretreated or not with 30 μM piceatannol (Pic) or 1 μM wortmannin (Wort) for 30 min. Cells were then stimulated with buffer (Ctrl) or with 100 ng/ml IL-4 for 2 h and labeled with Calcein-AM for 30 min. The number of adherent PMNs was calculated by counting the number of fluorescent cells from five randomly selected high-power fields (×400) observed by fluorescence microscopy. Results (means ± SEM, n = 4) are expressed as percentage of cells adhering onto A549 cells. ∗, p < 0.05 vs Ctrl. We then verified whether or not IL-4 induced neutrophil cell degranulation, to ensure that IL-4 did not induce nonspecific neutrophil responses. 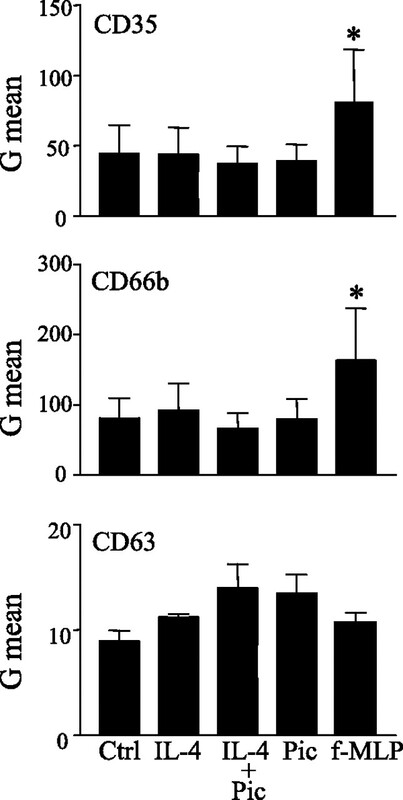 Degranulation was assessed by flow cytometry using CD35, CD66b, and CD63 for monitoring specific or gelatinase, secretory, and azurophilic granules, respectively (28, 29). As illustrated in Fig. 6⇓, IL-4, unlike fMLP, did not increase cell surface expression of CD35 and CD66b and, like fMLP, did not increase expression of CD63. Addition of piceatannol alone or in combination with IL-4 did not alter the level of cell surface expression of all three markers, eliminating the possibility that IL-4 and/or piceatannol nonspecifically activated human neutrophils. IL-4 does not induce PMN degranulation. Freshly isolated human PMNs (2 × 106 cells/ml) were pretreated or not with 30 μM piceatannol (Pic) for 30 min and then incubated with buffer (Ctrl), IL-4 (100 ng/ml), or fMLP (0.1 nM) for 30 min. Release of subset types of granules was evaluated by flow cytometry by monitoring cell surface expression of CD35, CD63, or CD66b as described in Materials and Methods. Results are from one representative experiment of at least three. ∗, p ≤ 0.05 vs Ctrl. Because of the well-recognized role of Syk in phagocytosis (12), and because one of the most important functions of PMNs is to exert phagocytosis, which is enhanced by IL-4 stimulation (7, 26), we used these cells to answer whether or not IL-4Rα could be a new cytokine receptor component that binds to Syk kinase. This was hypothesized based on our previous study, which reported an association between Syk and IL-15Rα in human PMNs (9) and the observation that PMNs expressed only the type I IL-4R composed of CD132 and IL-4Rα, and responded to IL-4 stimulation (2, 3, 7). In the present study, we demonstrated for the first time an association between Syk and IL-4Rα, an association that has never been reported in any other type of cell. Thus, in addition to IL-15Rα (9), IL-4Rα is another receptor component to which Syk is associated in human PMNs. Of note, in hematopoietic cells, association of Syk with receptor components of CD132-dependent cytokines, including IL-2, IL-4, IL-7, IL-9, IL-15, and (20) IL-21, is presently limited to IL-2Rβ (20, 30), IL-15Rα (9, 20), and now IL-4Rα (this report). Unlike previous studies, in which the importance of the association of Syk with IL-2Rβ and IL-15Rα has been reported but not clarified, we present in this study clear evidence that the association of Syk with IL-4Rα is involved not only in cell signaling, but also in the regulation of major neutrophil functions such as apoptosis, phagocytosis, and adhesion. In parallel to these functions, we confirmed previous data indicating that IL-4, by itself, does not induce neutrophil degranulation in the presence or absence of piceatannol. This was done to eliminate the possibility that IL-4 and/or piceatannol activated cells nonspecifically. This also eliminated the possibility of contaminants present in the preparation/handling of IL-4 and/or piceatannol, although we used low endotoxin level rhIL-4. This is important to clarify, because that activation of the recently identified triggering receptor expressed on myeloid cells-1 receptor by LPS in PMNs was found to induce degranulation (31), a situation that does not occur in response to IL-4 (Fig. 6⇑). In the present study, we not only report an association between Syk and IL-4Rα, but we also demonstrate that activation of PMNs by IL-4 increases the amount of Syk associated with IL-4Rα. Moreover, a pool of Syk associated with IL-4Rα is phosphorylated in IL-4-induced PMNs. The increase in levels of Syk was markedly reversed by the Syk inhibitor piceatannol, indicating the importance of the association in IL-4-induced PMNs. However, phosphorylation of Syk is dispensable for its association with IL-4Rα because we observed binding with unphosphorylated form of Syk with IL-4Rα. It is plausible that, upon IL-4 stimulation, phosphorylation of IL-4Rα occurs but, because of rapid protein phosphorylation and dephosphorylation events, the pool of P-IL-4Rα is very weak and undetectable by our experimental approach (data not shown). Syk is a 72-kDa protein kinase that belongs to the Syk-Zap-70 family and while Zap-70 expression is limited to T and NK cells, Syk is expressed by virtually all hematopoietic cells (10, 11, 12, 13, 14, 15, 16, 17, 18). In this study, we also found an association of Syk with IL-4Rα in human Raji B cells as well as in PBMCs, indicating that such an association is not limited to PMNs. However, in contrast to PMNs, IL-4 did not increase the amount of Syk associated to IL-4Rα in Raji and PBMCs, according to the experimental conditions we used. We do not rule out the possibility that IL-4 could also enhance such an association in these or other cells, but this will require further investigation. In addition to the Syk/IL-4Rα association in PMNs, we demonstrated that at least a pool of Syk is also associated with at three different proteins, namely PLCγ (PLCγ2 in the present case), pAkt, and α-tubulin. Furthermore, the associations Syk/PLCγ2 and Syk/α-tubulin are enhanced in response to IL-4. Probably only a very weak amount of α-tubulin is phopshorylated, because we were not able to detect convincingly the phosphorylated form (data not shown). Another possibility is that α-tubulin is rapidly dephosphorylated under the experimental conditions used. In contrast, an important pool of phosphorylated Akt was associated with Syk after IL-4 treatment. This is in agreement with the known activation of the PI3K/Akt pathway downstream to Syk (24, 25, 32). However, to the best of our knowledge, no one has reported a physical association between Syk and pAkt or Akt. Whether this interaction is direct or indirect in human PMNs is presently unknown and will require further investigation. Although we have limited our study to PLCγ2, pAkt, and α-tubulin, Syk is known to possess numerous other substrates, including, PI3K, SLP-76, c-CBL, Pyk2, and Vav (12, 13, 14, 15, 33). In future, it would be of interest to elucidate whether or not potential associations of Syk with its other substrates are enhanced by IL-4, not only in PMNs but in all other hematopoietic cells where such an association is observed. Because strategies to block Syk activation may have therapeutic benefits in certain cell types associated with disorders, including rheumatoid arthritis and allergic rhinitis (34), our present data are of biological significance, given that IL-4 and/or PMNs are involved in such disorders. Although we have previously demonstrated the molecular events involved in IL-4-induced human PMNs, including activation of Syk, p38, Erk-1/2 and JNK MAPKs, Jak1, Jak2, STAT1, STAT6, and SOCS3 (3), we did not investigate the role of Akt. In the present study, in addition to the fact that IL-4 induces Akt phosphorylation in human PMNs, we demonstrated, using pharmacological inhibitors, that the Syk/PI3K/Akt pathway is involved in IL-4-induced phagocytosis and adhesion, two important PMN functions. We also demonstrated the importance of Syk for the antiapoptotic activity of IL-4, where a depletion of Syk with Syk-ASO reversed the effect of IL-4. Thus, the association between Syk and IL-4Rα has major biological consequences. Interestingly, α-tubulin was recently reported to be phosphorylated on tyrosine residues by Jak-2 and to interact with and be involved in the nuclear transport of STAT1 (35). This is in agreement with our previous results demonstrating that IL-4 activates Jak2/STAT1 in PMNs (3). Because PMNs are key players in inflammation known to exert unwanted roles in inflammatory diseases such as rheumatoid arthritis, agents delaying their apoptotic rate will indirectly propagate their deleterious effects, because these cells will survive for a longer period of time, leading to the possibility of further damaging cells and tissues and exacerbating inflammation. This is the case of the CD132 cytokines IL-4 and IL-15, two cytokines that inhibit human neutrophil apoptosis (2, 6). Although high concentrations of IL-15 have been associated with different inflammatory diseases (36, 37), IL-4 is generally perceived as an anti-inflammatory cytokine. However, this latter cytokine is typically associated with the development of allergic responses via their induction of Th2 cells and promotion of IgE production. Moreover, it has recently become clear that IL-4 produced in inflamed tissues can activate signaling events in normal resident cells of the airway (38). Interestingly, both IL-4 and IL-15 cytokines activate Syk in human PMNs (2, 3, 6, 7, 9) and enhance phagocytosis and adhesion, two important biological processes involved during inflammation. Although the biological activities of these two cytokines appear to be redundant in PMNs, this does not rule out the possibility that major differences will be reported in future. Fig. 7⇓ illustrates a model that summarizes the biological importance of the association of Syk with IL-4Rα in human PMNs. In this model, a basal level of Syk is constitutively associated with IL-4Rα (A). Upon activation with IL-4, an increased amount of Syk became associated with IL-4Rα (B, step 1), among which, a pool of Syk is phosphorylated (step 2). This leads to the interaction between Syk and PLCγ2 (step 3), as well as between Syk and pAkt (step 4) and between Syk and α-tubulin (step 5). These steps are important for the biological activities induced by IL-4, including its antiapoptotic effect and its ability to enhance phagocytosis and adhesion (step 6). Finally, the biological activities of IL-4 are reversed by the two pharmacological inhibitors, piceatannol and wortmannin (step 7). The underlying mechanisms resulting from Syk/α-tubulin association is not clear and is under investigation in our laboratory. However, given that IL-4 activates Jak-2 in human PMNs (3) and that, as mentioned previously, Jak-2 is known to phosphorylate α-tubulin (35), it is tempting to speculate that this could also occur in PMNs. However, this remains to be determined. Model summarizing the biological importance of the association of Syk with IL-4Rα in human PMNs. In this model, a basal level of Syk is constitutively associated with IL-4Rα (A). Upon activation with IL-4, an increased amount of Syk became associated with IL-4Rα (B, step 1), among which a pool of Syk is phosphorylated (step 2), leading to the interaction between Syk and PLCγ2 (step 3); Syk and pAkt (step 4); and Syk and α-tubulin (step 5). These steps are important for the biological activities induced by IL-4 (step 6) as the biological activities of IL-4 are reversed by the two pharmacological inhibitors, piceatannol and wortmannin (step 7). Because of the importance of apoptosis in the resolution of inflammation and knowing that Syk is a key player in IL-4-induced suppression of apoptosis, as demonstrated using pharmacological inhibitors and antisense compounds, our data support the development of therapeutic strategies based on blocking Syk activation (34). We believe that the present study, which demonstrates for the first time that IL-4Rα is a new protein to which Syk can physically associate in human PMNs, and also in Raji B cells and in PBMCs, will lead to future important discoveries, resulting from the investigation of such an association in a variety of situations that are presently unexpected. We thank Mary Gregory for reading this manuscript. ↵1 This study was partly supported by the Canadian Institutes of Health Research (CIHR; MOP-89534) and Fonds de la Recherche en Santé du Québec (FRSQ). J.E. holds a Fondation Armand-Frappier Post-doctoral award and D.G. is a Scholar from FRSQ. ↵3 Abbreviations used in this paper: PMN, polymorphonuclear neutrophil; ASO, antisense oligonucleotide; scr-ODN, scrambled oligonucleotide. Kovanen, P. E., W. J. Leonard. 2004. Cytokines and immunodeficiency diseases: critical roles of the γc-dependent cytokines interleukins 2, 4, 7, 9, 15, and 21, and their signaling pathways. Immunol. Rev. 202: 67-83. Girard, D., R. Paquin, A. D. Beaulieu. 1997. Responsiveness of human neutrophils to interleukin-4: induction of cytoskeletal rearrangements, de novo protein synthesis and delay of apoptosis. Biochem. J. 325: 147-153. Ratthe, C., M. Pelletier, S. Chiasson, D. Girard. 2007. Molecular mechanisms involved in interleukin-4-induced human neutrophils: expression and regulation of suppressor of cytokine signaling. J. Leukocyte Biol. 81: 1287-1296. Girard, D.. 2003. Phenotypic and functional change of neutrophils activated by cytokines utilizing the common cytokine receptor γ chain. Chem. Immunol. Allergy 83: 64-80. Pelletier, M., A. Bouchard, D. Girard. 2004. In vivo and in vitro roles of IL-21 in inflammation. J. Immunol. 173: 7521-7530. Girard, D., M. E. Paquet, R. Paquin, A. D. Beaulieu. 1996. Differential effects of interleukin-15 (IL-15) and IL-2 on human neutrophils: modulation of phagocytosis, cytoskeleton rearrangement, gene expression, and apoptosis by IL-15. Blood 88: 3176-3184. Boey, H., R. Rosenbaum, J. Castracane, L. Borish. 1989. Interleukin-4 is a neutrophil activator. J. Allergy Clin. Immunol. 83: 978-984. Ratthe, C., D. Girard. 2008. Investigation of the interleukin (IL)-4/IL-4 receptor system in promyelocytic leukaemia PLB-985 cells during differentiation toward neutrophil-like phenotype: mechanism involved in IL-4-induced SOCS3 protein expression. Br. J. Haematol. 140: 59-70. Abram, C. L., C. A. Lowell. 2007. Convergence of immunoreceptor and integrin signaling. Immunol. Rev. 218: 29-44. Latour, S., A. Veillette. 2001. Proximal protein tyrosine kinases in immunoreceptor signaling. Curr. Opin. Immunol. 13: 299-306. Berton, G., A. Mocsai, C. A. Lowell. 2005. Src and Syk kinases: key regulators of phagocytic cell activation. Trends Immunol. 26: 208-214. Wong, B. R., E. B. Grossbard, D. G. Payan, E. S. Masuda. 2004. Targeting Syk as a treatment for allergic and autoimmune disorders. Expert Opin. Investig. Drugs 13: 743-762. Turner, M., E. Schweighoffer, F. Colucci, J. P. Di Santo, V. L. Tybulewicz. 2000. Tyrosine kinase SYK: essential functions for immunoreceptor signaling. Immunol. Today 21: 148-154. Mocsai, A., C. L. Abram, Z. Jakus, Y. Hu, L. L. Lanier, C. A. Lowell. 2006. Integrin signaling in neutrophils and macrophages uses adaptors containing immunoreceptor tyrosine-based activation motifs. Nat. Immunol. 7: 1326-1333. Schymeinsky, J., C. Then, B. Walzog. 2005. The non-receptor tyrosine kinase Syk regulates lamellipodium formation and site-directed migration of human leukocytes. J. Cell Physiol. 204: 614-622. Faruki, S., R. L. Geahlen, D. J. Asai. 2000. Syk-dependent phosphorylation of microtubules in activated B-lymphocytes. J. Cell Sci. 113: 2557-2565. Law, C. L., K. A. Chandran, S. P. Sidorenko, E. A. Clark. 1996. Phospholipase C-γ1 interacts with conserved phosphotyrosyl residues in the linker region of Syk and is a substrate for Syk. Mol. Cell Biol. 16: 1305-1315. Bulanova, E., V. Budagian, T. Pohl, H. Krause, H. Durkop, R. Paus, S. Bulfone-Paus. 2001. The IL-15R α chain signals through association with Syk in human B cells. J. Immunol. 167: 6292-6302. Huang, Z. Y., D. R. Barreda, R. G. Worth, Z. K. Indik, M. K. Kim, P. Chien, A. D. Schreiber. 2006. Differential kinase requirements in human and mouse Fc-γ receptor phagocytosis and endocytosis. J. Leukocyte Biol. 80: 1553-1562. Yousefi, S., D. C. Hoessli, K. Blaser, G. B. Mills, H. U. Simon. 1996. Requirement of Lyn and Syk tyrosine kinases for the prevention of apoptosis by cytokines in human eosinophils. J. Exp. Med. 183: 1407-1414. Pelletier, M., D. Girard. 2005. Interleukin-15 increases neutrophil adhesion onto human respiratory epithelial A549 cells and attracts neutrophils in vivo. Clin. Exp. Immunol. 141: 315-325. Rodriguez, R., M. Matsuda, O. Perisic, J. Bravo, A. Paul, N. P. Jones, Y. Light, K. Swann, R. L. Williams, M. Katan. 2001. Tyrosine residues in phospholipase Cγ 2 essential for the enzyme function in B-cell signaling. J. Biol. Chem. 276: 47982-47992. Rodriguez, R., M. Matsuda, A. Storey, M. Katan. 2003. Requirements for distinct steps of phospholipase Cγ2 regulation, membrane-raft-dependent targeting and subsequent enzyme activation in B-cell signaling. Biochem J. 374: 269-280. Girard, D., N. Boiani, A. D. Beaulieu. 1998. Human neutrophils express the interleukin-15 receptor α chain (IL-15Rα) but not the IL-9Rα component. Clin. Immunol. Immunopathol. 88: 232-240. Jog, N. R., M. J. Rane, G. Lominadze, G. C. Luerman, R. A. Ward, K. R. McLeish. 2007. The actin cytoskeleton regulates exocytosis of all neutrophil granule subsets. Am. J. Physiol. 292: C1690-C1700. Binet, F., D. Girard. 2008. Novel human neutrophil agonistic properties of arsenic trioxide: involvement of p38 mitogen-activated protein kinase and/or c-jun NH2-terminal MAPK but not extracellular signal-regulated kinases-1/2. J. Leukocyte Biol. 84: 1613-1622. Minami, Y., Y. Nakagawa, A. Kawahara, T. Miyazaki, K. Sada, H. Yamamura, T. Taniguchi. 1995. Protein tyrosine kinase Syk is associated with and activated by the IL-2 receptor: possible link with the c-myc induction pathway. Immunity 2: 89-100. Radsak, M. P., H. R. Salih, H. G. Rammensee, H. Schild. 2004. Triggering receptor expressed on myeloid cells-1 in neutrophil inflammatory responses: differential regulation of activation and survival. J. Immunol. 172: 4956-4963. Masuda, E. S., J. Schmitz. 2008. Syk inhibitors as treatment for allergic rhinitis. Pulm. Pharmacol. Ther. 21: 461-467. Ma, X., P. P. Sayeski. 2007. Identification of tubulin as a substrate of Jak2 tyrosine kinase and its role in Jak2-dependent signaling. Biochemistry 46: 7153-7162. Gonzalez-Alvaro, I., A. M. Ortiz, R. Garcia-Vicuna, A. Balsa, D. Pascual-Salcedo, A. Laffon. 2003. Increased serum levels of interleukin-15 in rheumatoid arthritis with long- term disease. Clin. Exp. Rheumatol. 21: 639-642. Muro, S., R. Taha, A. Tsicopoulos, R. Olivenstein, A. B. Tonnel, P. Christodoulopoulos, B. Wallaert, Q. Hamid. 2001. Expression of IL-15 in inflammatory pulmonary diseases. J. Allergy Clin. Immunol. 108: 970-975. Kuperman, D. A., R. P. Schleimer. 2008. Interleukin-4, interleukin-13, signal transducer and activator of transcription factor 6, and allergic asthma. Curr Mol. Med. 8: 384-392.